On Monday, Jeff Alworth broke the news that we'll soon have another brewpub in close-in SE Portland, at 28th and Ankeny. Jeff was walking past the former Noble Rot location on Sunday and noticed a yeast experiment going on inside. Luckily, the proprietors were puttering around and he was able to get some info on their new pub, called Hobo Brewing, which they hope to have open this summer. 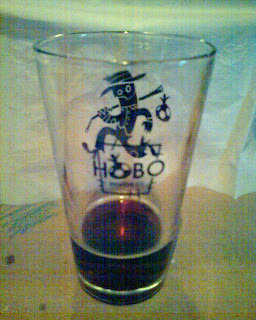 Tuesday night at EastBurn I looked down at my nearly empty glass and noticed it had the Hobo Brewing logo on it! That gave me quite a charge. My grainy cellphone photo leaves -- as usual -- a lot to be desired, but at least my hand model Dave was there to hold up a napkin behind it, and Picasa was able to dial up the contrast so you can get an idea of the logo. The hobo figure is actually on the back of the glass. No website yet, but they've got their glassware out in the neighborhood. That's a little bit of Full Sail Keelhauler in the glass. It's a lovely malty beer, billed as a Scottish Ale, but not as sweet and dense as a wee heavy can get. The taste reminds me a little of an Abbey Ale, there's just a hint of that flowery yeast flavor. Good stuff. Anyway, I'm excited to hear about Hobo, and look forward to checking them out when they open! Your Thoughts on the Spring Beer Fest?